And don't forget, this is the last week to enter my spring green-ing giveaway $75 Whole Foods gift card prize. And check out the many AMAZING comments for ideas on how to add some green to your life this spring. Super inspiring ideas! First some photos ... recipe links below! Drinks / Smoothies - You can serve these all week long to get in a spring-y mood! Carrot Pineapple Juice. Spring bunnies love waking up to this bright orange fresh juice, loaded with vitamin A, accented with fresh ginger! Happy Easter Smoothie. Three colorful fruity layers in your smoothie glass on Easter morning. Color fun without dying eggs! Coconut Whippuccino. Serve these cappuccino-inspired espresso shots on Easter. Sub the espresso with matcha or chai tea if desired. Matcha. Try a minty matcha latte at brunch or at the end of you meal for a soothing warming, refreshing mug. Brunch-ing it! - If you celebrate in the AM! Truffled Tofu Scramble with Peas. This pea-infused, truffled tofu with bold amazing flavors is a special way to serve up brunch scramble for Easter. Coffee Cake Cinnamon Rolls. These decadent coffee cake cinnamon rolls can be slathered in orange cream frosting for a spring-y cinna roll treat. Fresh Herb Frittata. This fresh herb tofu frittata is accented with spicy harissa, chia seeds and kale. Protein-rich and delicious! Quiche. This herbed quiche is a classic-gone-vegan brunch favorite. Coconut Butter Spreads. Try a few fun-flavored coconut butter spreads slathered on toast or muffins at brunch. Try strawberry, cacao, goji berry, banana and more creative flavors. Loaded Bagels. Grab some bagels and make bunch easy and amazing. These loaded toasted bagels are topped with homemade lemon-pepper cashew walnut spread. Yummy on toast or with veggies too! Superfood Fruit Rice Cacao Bowl or Fruit Salad. This creative, dreamy, superfood bowl loaded with fresh fruit has Easter written all over it! Just check out these colors! Muffins. These superfood goji/cacao muffins are a nice grab-and-go addition to brunch or a casual Easter morning. Waffles. Apple Cinnamon Ginger Waffles for brunch please! Maple syrup or soy whip on top. Berry Bagel Spread. This bright pink bagel spread made using homemade strawberry jam is lovely for Easter bunch. Lemon Cashew Sandwiches. These amazing lemon-cashew-asparagus-jalapeno salad sandwiches are perfect light entree bites for an Easter brunch. 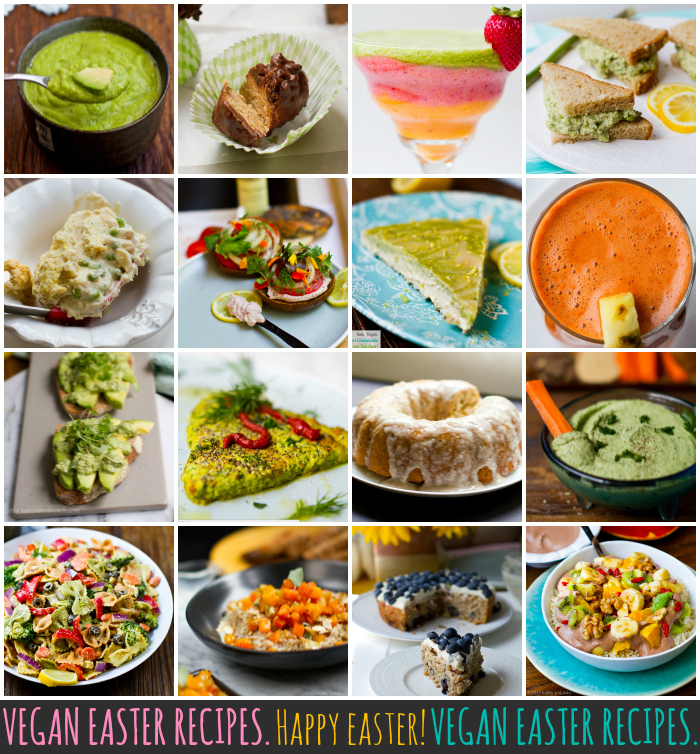 Appetizers - Spring-y Easter nibbles to snack on all week long! Avocado Toast. Avocado toast makes a lovely Easter appetizer! This recipe includes a lemon-y pesto topping that is sodium free. Lucky Leprechaun Dip. This green kale, bean and cashew dip will have your guests hovering over the veggie/cracker/dip station. Feel good about snacking on this all Easter long. Citrus Platter. This citrus, radish, avocado platter is beautiful to the eyes and to your taste buds! Plate full of health! Lentil-Nut herbed Pate. This rich and flavorful savory spread is a delicious, elegant appetizer. Loaded with protein, healthy fats and nutrients from the lentils and nuts. Beet Walnut Dip. This bright pink dip would be fun and pretty on Easter! Mushroom Scallops. Serve up some elegant, eye-catching scallops on Easter! Salads - Spring was MADE for pretty, rainbow-colored salads. Shredded Carrot. This lively, flavorful shredded carrot salad will make all the little bunnies (and you!) happy. Rainbow Slaw. Grab some colorful cabbage and make this rainbow slaw with sweet tahini dressing. Maple Mustard Chard. I adore this easy creamy maple mustard raw chard salad. Make this yummy dish for your table and fall in love with raw chard salads. Green Power Tower. This Green Tower power Salad with creamy tahini dressing, kale and chickpeas is hearty enough to be an entree, or serve in small portion sides for a boost of greens. Peanut Kale. This peanut ginger kale salad adds some warmth to your salad selection. Spicy ginger and wilted kale smothered in a creamy cooked peanut dressing. Wasabi Slaw. This pretty spring green slaw adds just the right amount of heat to your Easter meal! 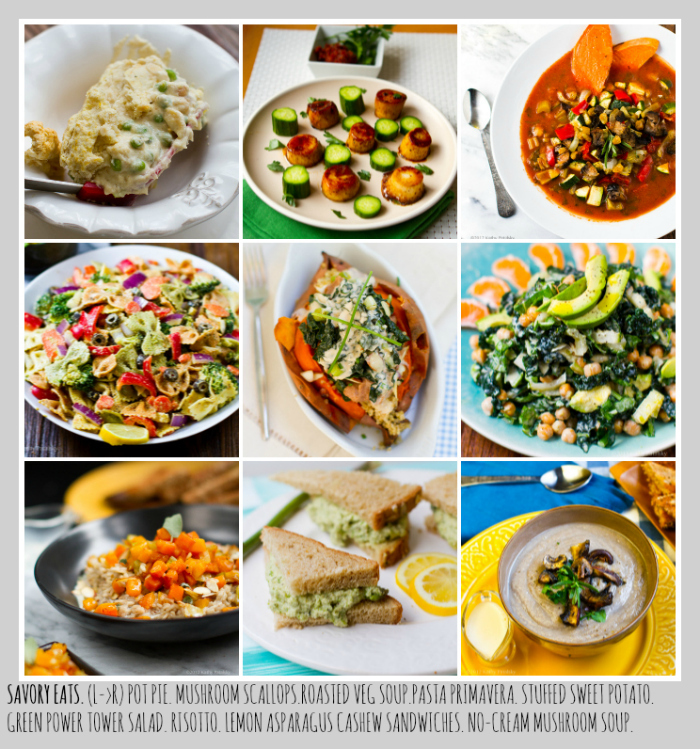 Soups - These light and lovely soups are perfect appetizers or light lunches this week. Roasted Veggie. This elegant roasted vegetable tomato-based soup is studded with golden raisins for a sweet special flavor. I love it! No-Cream Mushroom. This rich and creamy rosemary-accented mushroom soup has bold mushroom flavor, rich, savory, perfect accent to Easter spring-y flavors. Fresh Pea. Easy Miso Avocado Fresh English Pea Soup is a bright green color, Easter-perfection. Light and lovely starter. Entrees - Main event dishes to impress. Make this week special! Pot Pie. This creamy cashew veggie pot pie with a flaky, buttery biscuit crust is my first choice entree for Easter! Sweet spring peas in every bite! Stuffed Sweet Potatoes. Stuff some sweet potatoes this Easter! Fill them with whatever goodies you'd like - totally entree approved. Who doesn't love a good yam? Risotto. This butternut squash, sage and almond risotto can be customized however you'd like using seasonal veggies. Elegant, delicious and easier than you think! Pineapple Fried Quinoa. This fun entree includes a few tofu triangles, a pineapple boat and plenty or pineapple fried quinoa, served warm - very lively and flavorful! Pesto Pasta Primavera. This bow-tie pasta primavera is colorful and lively with a creamy avocado pesto on top. 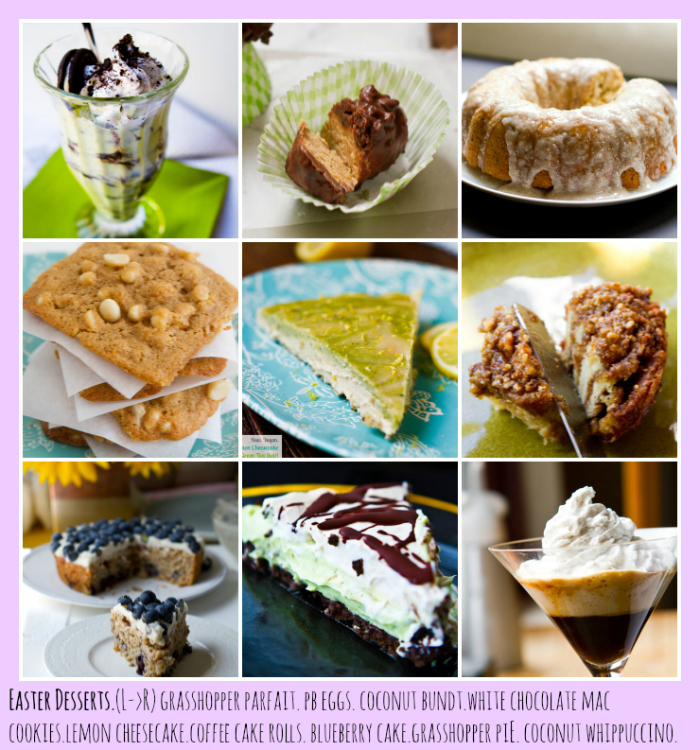 Desserts - Sweet spring treats for you and your favorite friends. Share dessert with someone you love this week! Blueberry Cake. This vanilla-frosted blueberry cake, loaded with fresh berries, is super spring-y. Lamb Cake. This was my attempt to veganize my family recipe for "Easter Lamb Cake" - coconut covered with fluffy white frosting. Color swirled cake! Chocolate Peanut Butter Truffles. Cute bunnies and eggs for your Easter treat baskets. 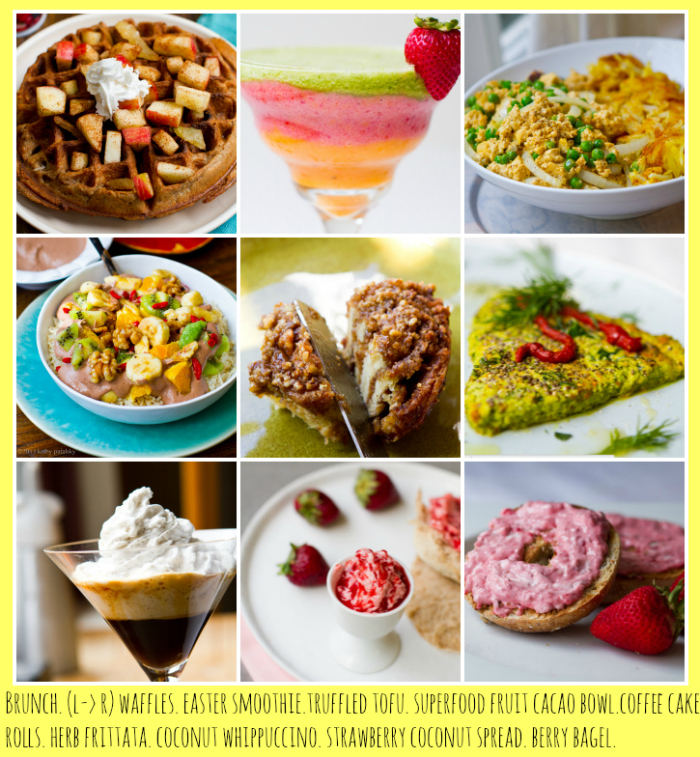 Healthy makeover recipe!! Lemon Cheesecake. This lemon cashew raw cheesecake with a lovely matcha green tea swirl is perfect for Easter dessert. Refreshing flavors! Grasshopper Pie. Minty chocolate grasshopper pie or a creamy parfait. Spring green colors swirled with dark chocolate. Coconut Bundt Cake. Try a moist coconut bundt cake with amazing rich coconut glaze. Your guests will swoon over this cozy classic gone vegan. White chocolate Cookies. Try some lovely white chocolate and macadamia nut cookies for Easter. Beachy and sunny day-filled flavors.